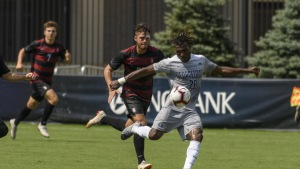 WASHINGTON – The Georgetown University men’s soccer squad took down the No. 9 Duke University Blue Devils (3-2-0), 1-0, on Tuesday in a non-conference matchup at Koskinen Stadium. With the win, the Blue & Gray improves to 4-2-1 overall with two non-conference games remaining. Tune in to the Fall Sports Update in  Minutes!